The Greyp G12 bike is first electric bicycle manufactured by Rimac Automobili. Rimac is a Croatian Electric supercar manufacturer which Mate Rimac founded. The Greyp G12 is an electric bicycle. However, Greyp bike is a mix of both Motorcycle and a bicycle. The team dedicated long hours to build the e-bicycle to get the best user experience possible. For the first time, a bicycle has a vehicle control unit (ECU). The lithium-ion batteries give 12kW power to the in-wheel motor with regenerative braking functionality. So, such a dynamic nature of the bike gives lasting user experience with maximum performance. First of all, it’s the first bicycle which offers a fingerprint unlock system. The biometric sensor unlocks the bicycle with a finger scan. In addition, the simple touch of your middle finger will activate the Power mode while a touch of your thumb will activate the street mode. The e-bike has three riding modes namely Street Eco and Power. In general, electric vehicles having two wheels are considered as Motorcycles. 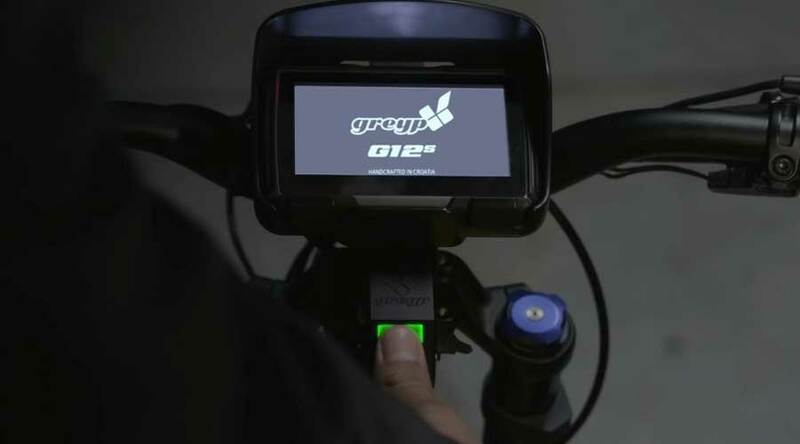 So in order to comply with regulations, The Greyp G12 bike has a special mode to limit the power and speed. Furthermore, the top speed is just a tap away on touchscreen whenever you need it. In addition, the screen in front of the rider displays a large amount of data including Temperatures, speed, power consumption, and range. So, the bike simply keeps you up-to-date with all the information. Thus, you can plan your rides accordingly without any hassle. 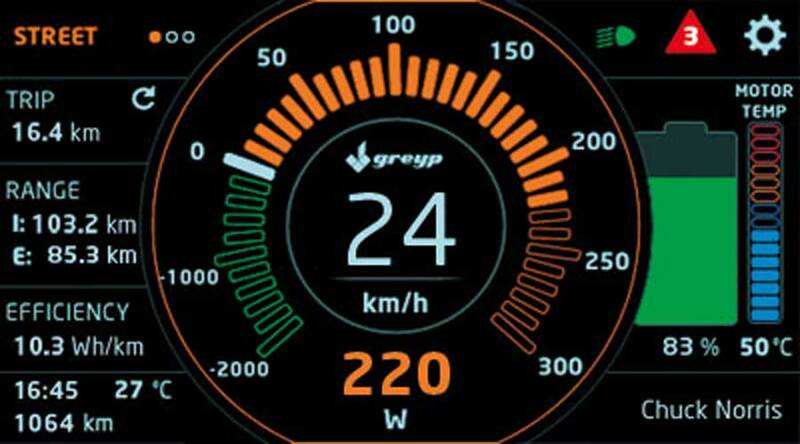 The Greyp G12 can achieve the top speed of 70kmph without any assistance from the rider. So, while riding an uphill; forget about sweating. With a single charge, Greyp G12 can cover the distance of 120kms. The algorithms running in the background predicts the distance you can cover. It tells to slow down and helps in conserving the energy; ultimately taking you to your destination. Furthermore, you don’t need any mechanical brakes. The regenerative braking system in this bike is enough to control the bike. It can charge the battery with 2kW of power while braking. The state of the art top notch Hydraulic disc brakes is also at your disposal in an emergency situation. So, the bike has a lot of braking power. The Greyp G 12 can recharge from 0-100 percent in 80 minutes. The state-of-the-art battery pack designed by Rimac can produce 1.5 kWh. The advance Battery management system analyzes every single cell at 100 times every second. As a result, you will get best riding estimate possible. The behavior of every cell can be monitored and displayed in real time on the screen with temperatures. The battery management system along with lithium-ion battery provides 1000 cycles (charging and discharging) and still holds 75% of its capacity. The bike basically has a rugged design. Rimac designed the mechanical components in such a way that they can withstand rough terrains. The bike's chassis and swingarm are made up of high-quality steel. The stress testing and benchmarking is done at every stage of production to ensure high quality. The Greyp bike delivers the different amount of power at different riding modes. In Speed mode, the power is 12kW while in Street mode, it is 250W. The top speed in Speed mode is 70 km/hour. The weight of the bike is 48.5kg. The range of the bike is 120km once charged. The recharge time is 80 minutes while the regenerative braking power is 2kW. The lithium-ion battery capacity is 1.5 kWh. The low and high voltage protection is present. It has the temperature protection as well. The carbon-fiber body panels along with seamless frame give Greyp bike unmatched finish. The bottom bracket two-speed ATS drive (planetary gears) gives the smooth flow of power to rear wheels. Direct drive BLDC custom motor gives a seamless performance. The state-of-the-art Rockshox Boxxer RC front suspension and Rockshox Vivid R2C suspension at the rear gives a smooth & comfortable ride. The 4.3” full-color display gives crisp & clear information in real time. In conclusion, the Greyp G12 bike is new generation electric bicycle combining speed, power, and comfort all at the same time. 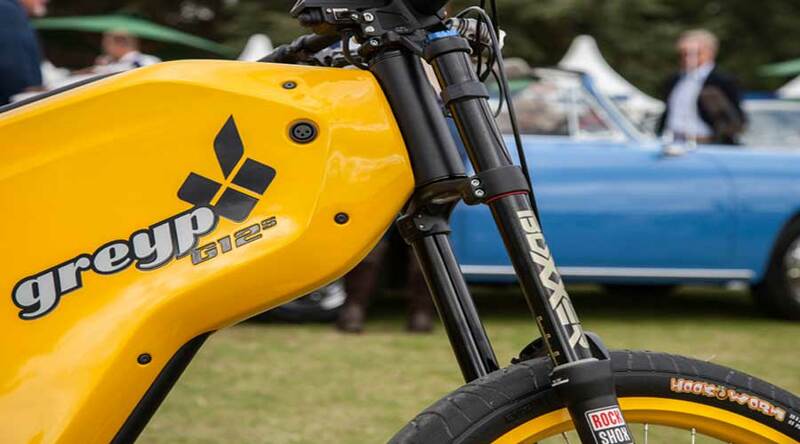 Home » Articles » Greyp G12 Bike: Guess what is it… a bicycle or a motorcycle?